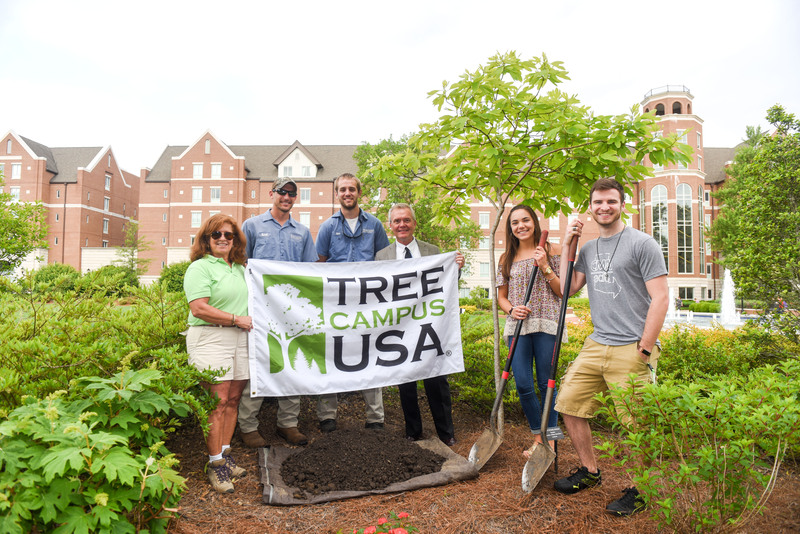 The Arbor Day Foundation recently honored Belmont University for its conservation efforts and its commitment to effective urban forest management by recognizing it as a Tree Campus USA® for 2017. This is Belmont’s 4th consecutive year receiving the recognition. Tree Campus USA® is a national program that honors colleges and universities committed to engaging staff and students in conservation goals. The program is celebrating its 10th anniversary this year. Belmont achieved the title by meeting the programs’ five standards which include maintaining a tree advisory committee, having a campus tree care plan, dedicating annual expenditures for its campus tree program, having an Arbor Day observance and engaging students in a related service-learning project. The Arbor Day Foundation has helped campuses throughout the country plant thousands of trees, and Tree Campus USA colleges and universities invested more than $48 million in campus forest management last year. Belmont is committed to its campus-wide sustainability efforts and has a number of green initiatives that contribute to campus conservation including LEED certified buildings, educational and sustainable green roofs, geothermal heating and cooling systems and its Tennessee arboretum designation. In addition, Belmont continues to celebrate its Conservation Covenant, a campus-wide initiative that recognizes the University’s existing sustainability efforts and challenges campus to take the covenant even further. This year, Belmont students, faculty and staff will continue in their charge by celebrating Earth Day 2018 in a number of ways including a week-long celebration leading up to the big day.